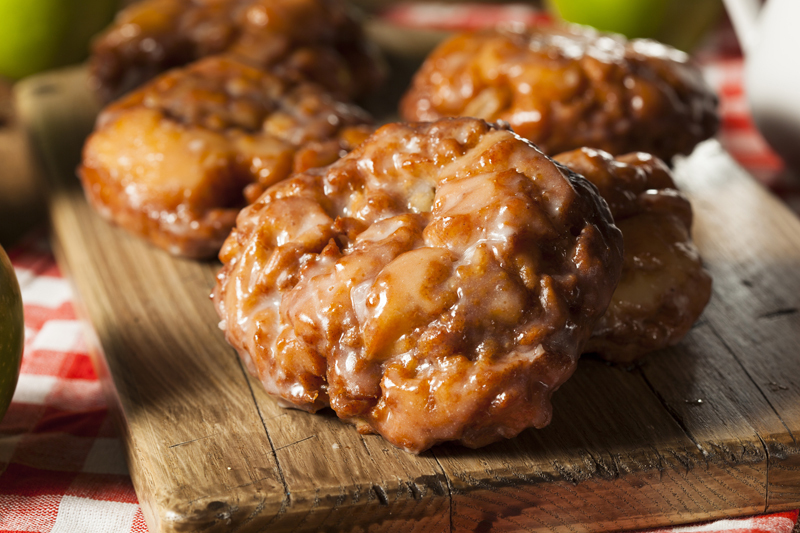 Apple Fritters. Oh, for the love of all things you'd like to sink your teeth into! Can we just stop for a moment and talk about how good these are? A delicious deep-fried donut with sweet little pieces of apple running all through them. They're amazing served with a light glaze, drizzled with maple syrup, or dusted with powdered sugar. We'll take ours any way we can get them! Vegetable oil, for deep-frying, 2 to 3 cups depending on the size of your pan or deep fryer. Heat a couple of inches of vegetable oil in a heavy pot over medium to medium-low heat until a deep-fry thermometer inserted in the oil registers 340° degrees F.
In a large mixing bowl, combine the flour, granulated sugar, baking powder, cinnamon, and salt. In a separate medium-sized bowl, beat the egg mixture with a whisk, then add the milk, melted butter, and vanilla. Pour the wet ingredients into the dry and gently fold together until just combined. (don't over-mix). Next, fold in the apples. Carefully, drop heaping tablespoons of batter into the hot oil, 4 to 6 at a time and fry until golden brown, about 4 to 6 minutes, turning halfway through. Remove the fritters and drain on paper towels. Meanwhile, make the glaze: Sift the powdered sugar into a medium bowl. Stir in the milk and vanilla until smooth. Brush the glaze onto the fritters and serve warm.